The day is fast approaching when printers will produce all kinds of 3-D objects -- from toys to tools -- on the cheap, writes Business 2.0. (Business 2.0 Magazine) -- After midnight, it's dark and nearly silent in the Klock Werks Kustom Cycles shop in Mitchell, S.D. The only sound is the low hum emanating from a box that looks like a cross between a dormitory fridge and a Xerox machine. Behind a compartment of clear glass, the device - a Stratasys Prodigy 3-D printer - is constructing a complex shape, all curves and spaces, out of plastic. THROTTLING UP: Brian Klock says his $60,000 printer -- which produces motorcycle parts (red) virtually identical to machine-cut versions -- has paid for itself many times over. MODEL EMPLOYERS: The Brauns were so excited about the technology that they build a company around it. When he arrives at his shop in the morning, Brian Klock strolls over to the printer and pops open the glass compartment. Carefully breaking away the supports, he pulls out a perfectly turned machine part - a plastic housing that slides neatly into place between the metal handlebars of the custom-built motorcycle he's been working on, covering the fuel, speedometer, and other gauges. All that's left to do is to paint it. Klock has transformed a virtual 3-D model in his computer into an exact physical replica. He uses a process similar to the one Mother Nature uses to build structures out of sandstone, putting down one thin layer at a time. There are two basic methods. One involves "printing" (through an ink-jet process) liquid adhesive on fine-powder layers of plaster. The other uses a nozzle to deposit layers of molten polymer on a support structure. In a shop like Klock's, the piece can be used as is or as a prototype before remanufacturing it in metal. Ten years ago high-end printers like Klock's cost $120,000 or more. They were employed mainly by companies like Logitech (Charts) and Boeing (Charts, Fortune 500) for quickly testing prototypes of everything from computer mice to military aircraft. But the cost of the technology has been coming down rapidly. Today the cheapest commercial 3-D printers sell for about $20,000, making them affordable for all sorts of small businesses and entrepreneurs. Klock was an early adopter. He bought his Prodigy machine last year for $60,000 and says it has already paid for itself many times over. He can design lightweight motorcycle parts, test them, and make changes much faster - and with far less effort - than his competition can with hand tools or standard automated cutting machines. After a year, Klock says, his business has grown more than 150 percent, and he's getting inquiries about his products from all over the world. Klock used his 3-D printer to ramp up his business, but John Braun, a Phoenix-based project manager for a telecommunications company, was so excited by the technology that he built a brand-new company around it. He learned about rapid prototyping at a family get-together in 2003, when someone showed him a video of a 3-D printer in action. "He bugged out," his wife, Dena, recalls. "He was fascinated." The Brauns immediately started talking about what business they'd use it for. They toyed with several ideas - jewelry making, medical printing - before settling on architectural modeling. But when they tried to buy their own machine from Z Corp., a competitor to Stratasys, they ran into a roadblock. Z didn't normally sell to small businesses and had to be convinced that the company the Brauns called Alchemy Models was real before it would take their $50,000 check. Once the deal was done, the couple set out to sell their idea to local architectural firms, most of which had never even heard of the technology. "We've been at the forefront," says Braun, who dumped his day job a month ago to work full-time at Alchemy. The Z Spectrum 510 printer, one of the fastest on the market, allows Alchemy to create several models a day; traditional model makers often spend weeks painstakingly constructing their prototypes by hand out of cardboard or balsa wood. Although model makers may add their own special artistic flourishes, the computer-generated renditions show more detail and can be revised without starting from scratch. Of course, the 3-D printer can't do anything without a virtual blueprint to work with. Braun took a college course in computer-aided design to get started but says he taught himself most of what he knows. "It took me several months to learn to create something really good," he says. You don't need a degree in CAD to start a 3-D printing business, however. Even in tiny Mitchell, Klock was able to find an employee sufficiently proficient in CAD to turn his bar-napkin fantasy of the perfect motorcycle into a computer model. Now he's starting to make his own 3-D digital images. "It's the same as learning to draw on a computer," he says. "There's a learning curve." That curve should get less steep as the market for 3-D printers grows and manufacturers simplify the software. "3-D printing will follow the path of 2-D printing and other high-end technologies that became available to the masses," says Tom Clay, CEO of Z. "It will get easier, faster, and more affordable." 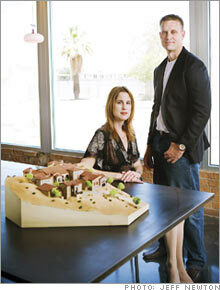 Eventually architecture firms could start printing their own 3-D models. But Braun says he's not worried. He figures someone will need to teach the architects how to use their new equipment. In the meantime, his business is booming. 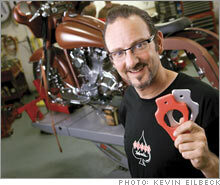 He expects his two-person company to sell $350,000 worth of models in the next year. And if the 3-D printing market balloons, as the 2-D printing market did 80 years ago, he's betting that someone will become the next Kinko's - and it might as well be him. He expects to serve all sorts of small businesses, making everything from power tool parts to figurines of Second Life characters. Klock's ambitions are more modest. "I'm blessed just to be here and cognitive enough to grasp the technology," he says. "3-D doesn't have to be for stealth bombers. It can be for something as simple as motorcycles." Chris Morrison is an editorial intern at Business 2.0.